January 15, 2013 /6 Comments/in Bottle Cap Crafts, Craft Ideas, Pony Beads, Spring Has Sprung, Valentine Crafts, Women's Ministry Crafts /by Craft Supplies for Less, Inc. 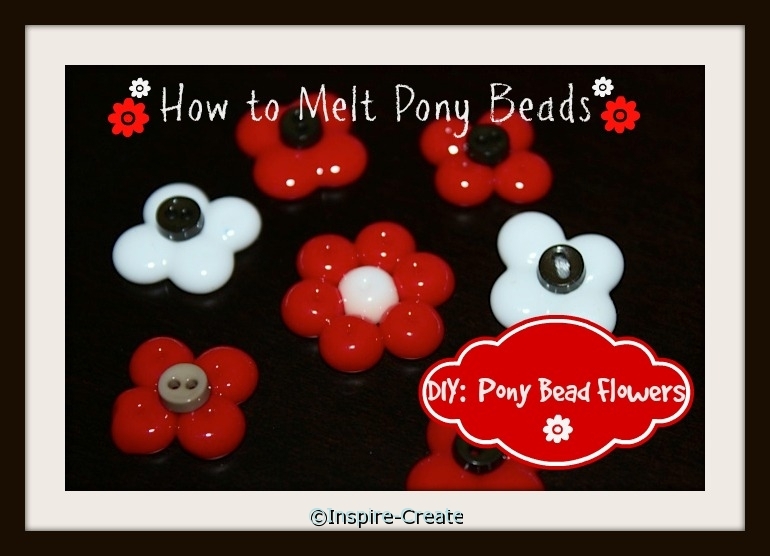 These Melted Pony Beads will look great as Flower Necklaces, Magnets, Hair Clips, and More! Using Chrome Bottle Caps we melted Pony Beads in the oven and turned them into amazing Flower Shapes! These melted pony bead flowers make great embellishments for many crafts. 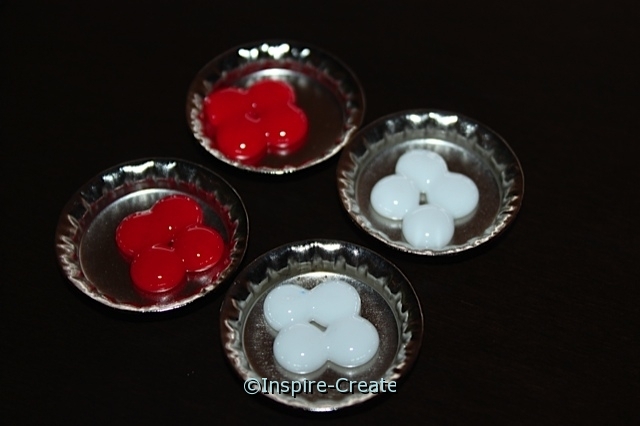 Melt 4) pony beads and add a mini button to the center or melt 6 beads (both designs are shown below). The creations are endless! Once melted, you can add these pony bead flowers to Clothespin Magnets, make into Necklaces, & More! These are just so fun to make and create with! Let’s get started. Pre-heat oven to 375 degrees. A small toaster oven will work too! Line an oven tray with foil and place Chrome Bottle Caps on the foil. The bottle cap will work as a frame for the pony beads as they melt. 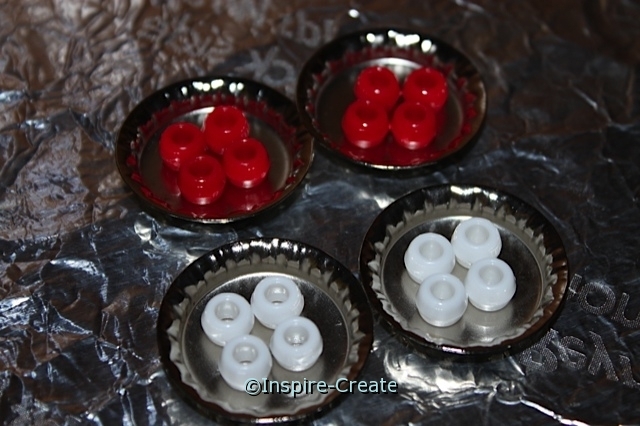 Don’t worry… the melted pony beads will pop right out of the bottle caps once they are cooled! Important: *Make sure these are craft bottle caps without liners. Don’t attempt to use recycled bottle caps as the liners will melt onto the pony beads. We chose to work with only a few bottle caps (4-5) at a time so that it was easier to transfer the beads to the oven without creating gaps. 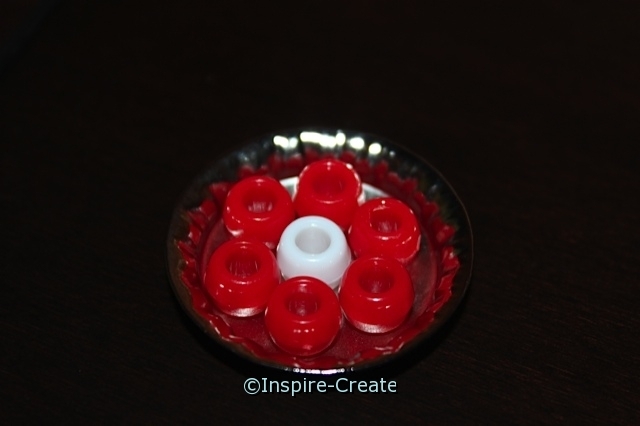 For small, one color flower pony beads, place 4 Pony Beads with the hole facing up into the center of the chrome bottle caps (shown below). 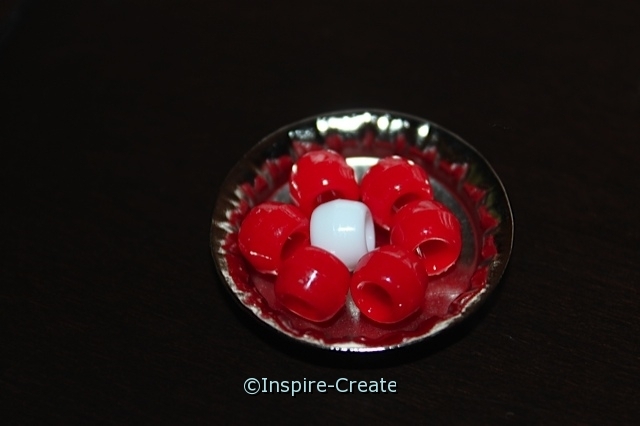 We used red and white pony beads, however, any colors will work. Just make sure to use Made in the USA pony beads that are lead free. Important: Make sure pony beads are touching so they will melt together! 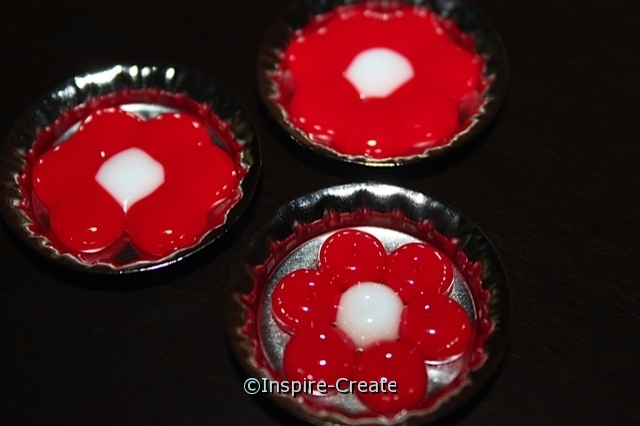 To make flowers with a different color center, place 1 bead in the center of the bottle cap and 5 beads around it. Once again, making sure all the beads are touching so they will melt together. Now it’s time to melt the pony beads in the oven! We found that 10-15 minutes was plenty of time to melt them enough to stay together and at the same time keep the raise up look of a pony bead. Therefore, we recommend you check the beads after 10 minutes. If you would like to melt them more, check every additional 5 minutes. The longer the beads are in the oven, the flatter they will get. In the photo below, you will see what happens as the beads are baked longer. The flower in front was baked for 10 mins and is more defined (raised up). The flower to the right and in the back are flatter just from baking longer. This is why we recommend checking on the beads after 10 minutes to see if the desired look has been reached. Remove the bottle caps and melted pony beads from oven and let cool completely as these are extremely hot & can burn! Even though they are super cute at this stage, let them cool completely before handling. Once pony beads are completely cooled, attach Mini Buttons to the center of the 4 pony bead flowers with E6000. Craft Tip: Put a small amount of E6000 on a piece of scrap paper or foil. 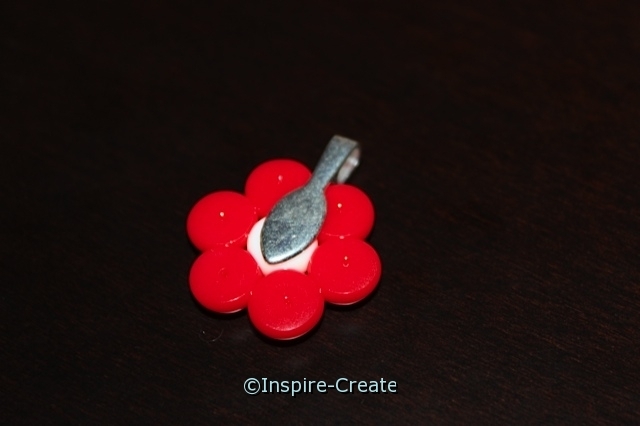 Then use a toothpick or opened paperclip to attach the Mini Buttons to the center of the Pony Bead Flower. This will save on adhesive as these mini buttons are really tiny! 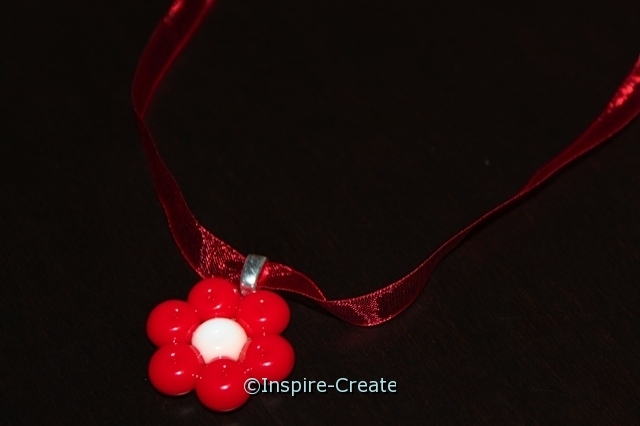 To make a Necklace, attach a Silver Jewelry Bail to the back of the melted pony bead flower with E6000. This is a self leveling adhesive so only a small amount is needed. It will dry with a flexible secure hold and be ready for sheer ribbon or silver chain! Once adhesive is completely dry, string Jewelry Bail with Sheer Ribbon, tie ends, and this adorable necklace is ready to wear! These are a perfect necklace for any girl party. Make a great group craft that kids will love to keep too! 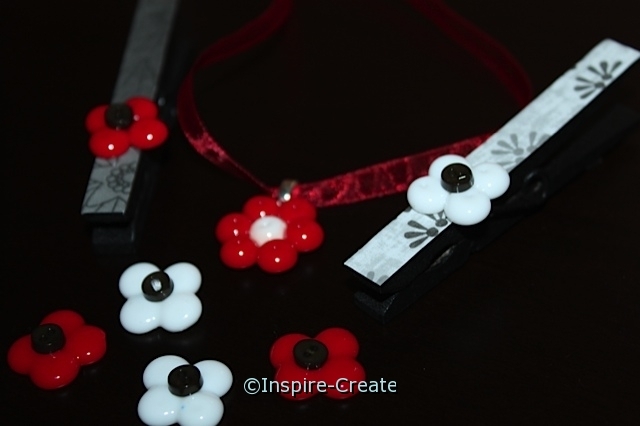 Ideas for Embellishments: Use on Clothespins, Bottle Cap Crafts, Scrapbook Pages, Cards, & More! Click here for complete step by step instructions for Clothespin Magnets made with Mod Podge, scrapbook paper, and a melted pony bead flower. Thread Button with Embroidery Floss before attaching with E6000. 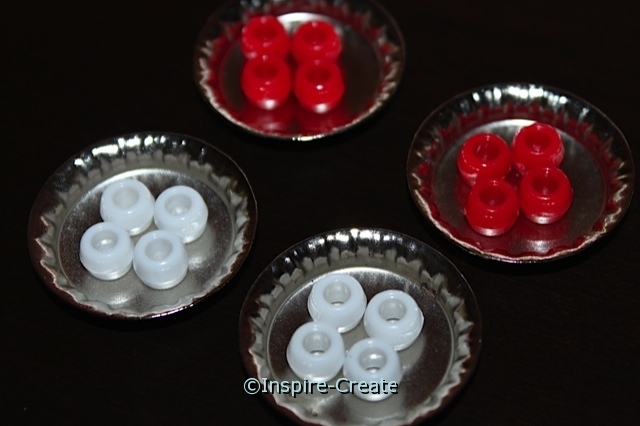 For a different look, place pony beads on their side in bottle cap. Can the bottle caps be reused? I have jillions of pony beads. …..somewhere. I want to try this. Does it stink up the house melting in the oven? We hope you will can find your pony beads and give this a try. They are a lot of fun! To answer your question, there will be a little smell while melting the beads. It shouldn’t be too bad as long as you melt Pony Beads that are Made in the USA. Also, make sure you don’t over “cook” them. They melt fast…10-15 mins. If you have a toaster oven it will work nicely and then you won’t have to heat up your big oven. When we tested these, we thought the odor was much less than the smell of Makit & Bakit crafts melting in the oven. Hope this helps. If you try these, please let us know how they turned out!! !